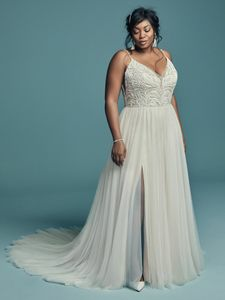 Description: This chic A-line offers additional coverage to our Charlene style, featuring a bodice accented in beaded lace motifs, Swarovski crystals, and sheer side insets atop a voluminous tulle skirt. Beaded spaghetti straps complete the V-neckline, trimmed in illusion, and V-back. Finished with covered buttons over zipper closure. Tulle veil accented in pearls and Swarovski crystals sold separately. *Veil pictured with Charlene, 8MS694.